We’re Helena, Montana's only locally owned health food store. Our mission is both to help people be healthier today and to provide that same blessing to future generations. That’s why we specialize in products that are healthful, nutritious, great-tasting and friendly to the environment. We carry a large selection of organic foods because they are grown and processed without the use of toxic pesticides, petroleum fertilizers or synthetic additives. Organic farming practices have been shown to benefit the health of consumers, farm workers and the environment. And, because we are certified by the State of Montana as an organic supermarket, when we say something is organic, it really is! Our purpose is to inspire and empower our customers to live to their fullest potential through optimum nutrition and a lifestyle in harmony with nature. To achieve this, we offer high-quality natural and organic foods and nutritional supplements, along with other socially and environmentally responsible products. And further, we dedicate ourselves to educating and learning from our customers as fellow participants in a community of healers. 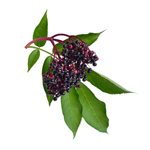 For centuries, European elder (Sambucus nigra), also known as black elder, has been valued in North America and Europe as a healing remedy. Use herbs to make your own skin care products. Chamomile, calendula, rosemary, sage, and mallow all help to preserve youthful skin. Chamomile and calendula are used for soothing and healing irritated skin. Rosemary and sage tone skin cells while mallow is used as a smoother and emollient.